Hi everyone on my popular blog, wohohohoho. Well its been a while since I posted a new blog. Have you all been waiting? I recently went to watch the Pussycat dolls and Lady Gaga perform in concert for my gf's birthday! Normally I wouldn't go to watch these people perform but I guess its ok with my gf. 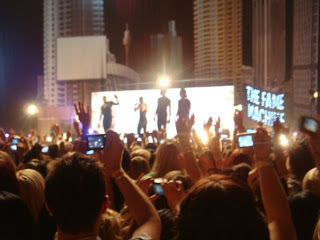 It was hot there and very tiring as we had floor tickets. So that meant we had to stand for the whole time...the lady was getting tired towards the end and we wanted to leave early. She is a bit short so it was hard for her to see past the peoples shoulders half of the time. But, we enjoyed it and by the time we got back to the car we couldn't wait to sit down in those comfortable Recaro seats....lol. It took almost an hour? to leave the car park. 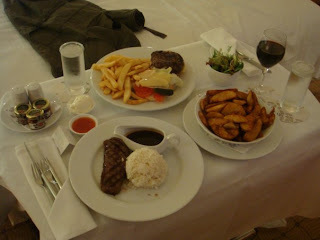 When we got back to our nice hotel, we ended up ordering food from room service! OMG I have never done this before. First experience. Ordered burger with chips, plate of wedges with sweet sour chilli, steak and rice, and glass of wine. Ended up being a little over 100 dollars! SO MUCH for that hahahaha.